Loneliness is mostly experienced as solitary and isolating. But can it become intersubjective, affective, moving between bodies, to form a collective loneliness? Does collective loneliness, the act of being lonely together, the act of identification with another’s loneliness, promote a sense of belonging? My site-specific, performative work intends to explore the tensions and conditions of belonging, collectivity, participation and intimacy. Through a series of site-specific interventions in different locations around the city (and hopefully the country and beyond), I create spaces or situations which would facilitate interaction, connection and reciprocity between myself and participants, as well as amongst the participants themselves. The spaces would invite participants to meditate on the human emotion or experience of loneliness and share their thoughts through video interviews, audio interviews, or written text. So far, there have been two iterations of this work in 2017 – one in physical space in Braamfontein and the other as a digital interactive piece. More live performances are planned for May and June 2018 in Johannesburg and for August in Berlin. The below video was produced from the first iteration of this project and was selected to be part of the Absa L’Atelier top 100. 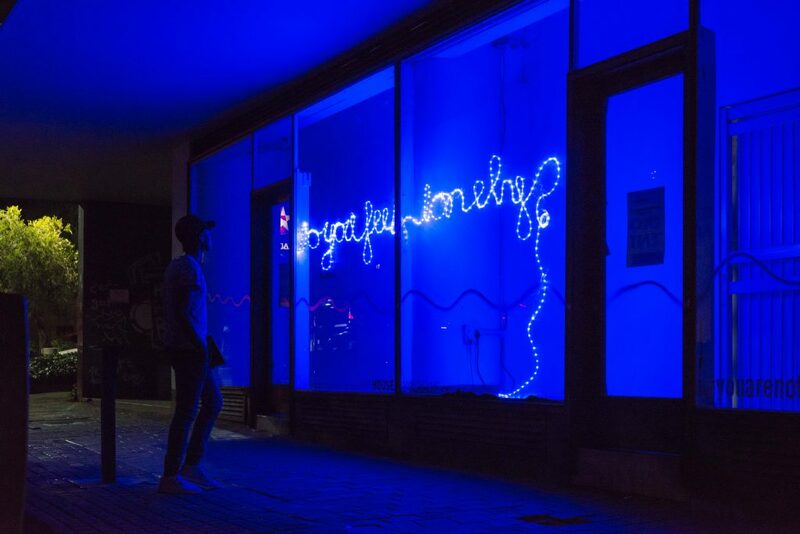 Lonely I (Braamfontein) is a video and sound piece that narrates collective loneliness through multiple voices. Are we really alone in our loneliness? Over a week period, the artist interviewed 40 people about their experiences of loneliness on the streets of Braamfontein, Johannesburg. The work conveys the sense of intimacy and human connection experienced by the artist during the interviews, where strangers came to share, heal, commiserate and, ultimately, to connect. Every interviewee’s voice has been used to create a sometimes cacophonous, sometimes solitary, and predominantly collective, narrative.